If you own a freshwater fish tank, then you're already aware of the need to change water regularly to keep your fish healthy, but what few people know is that the water can be recycled for plants. Using fish water to water plants can add an extra shot of nutrients to your plants' soil because of the fish waste. Because the fish waste is already in liquid form, it's easy to apply to any plant. 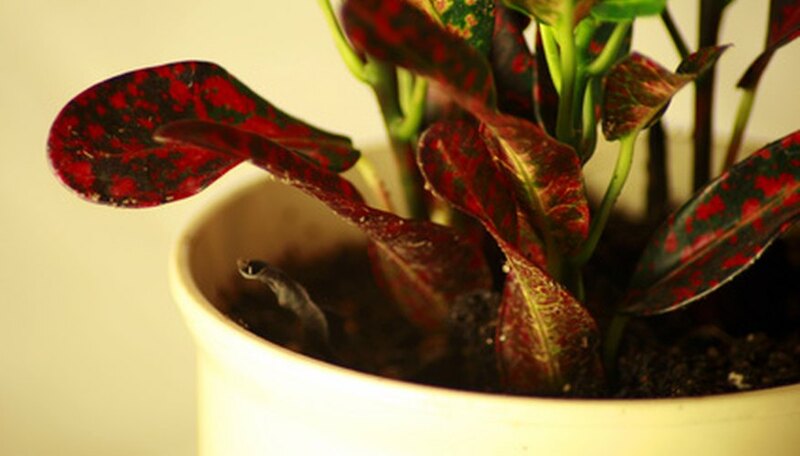 Plan to water houseplants and/or outdoor plants with fish water in place of, rather than in addition to, a regular watering, or you may drown your plants. Try to plan so that the two events occur together. Put a small bucket or large cup into the fish water and fill it with water. Pour the water into your watering can, but take care to only fill it as full as you can easily carry. Water your plants along the soil level at the base of the plant; avoid wetting the foliage and leaves. Add water to the plants until there is no fish water left or your plants are well watered. Water your plants with fish water as often as once a month, using regular watering as needed to keep the plants healthy between applications of fish water. Look at the bluegill fish's underbelly. This is located directly beneath its chin, toward the front section of the body. Identify the bluegill as a male if the scales look bright orange. Classify the bluegill as a female if the scales look pale yellow. Plants use light, nutrients in the water and carbon dioxide to produce oxygen. When the plant releases the oxygen it dissolves directly into the water making it available for fish and beneficial bacteria. Plants are very efficient at removing toxins and other nutrients from the water that might be harmful to fish and animals. They help reduce algae and bacterial blooms from clouding the water. Plants provide much needed shade for fish and other aquatic life. They prevent still spots in the water from overheating in the mid day sun and help regulating the overall temperature of the body of water. 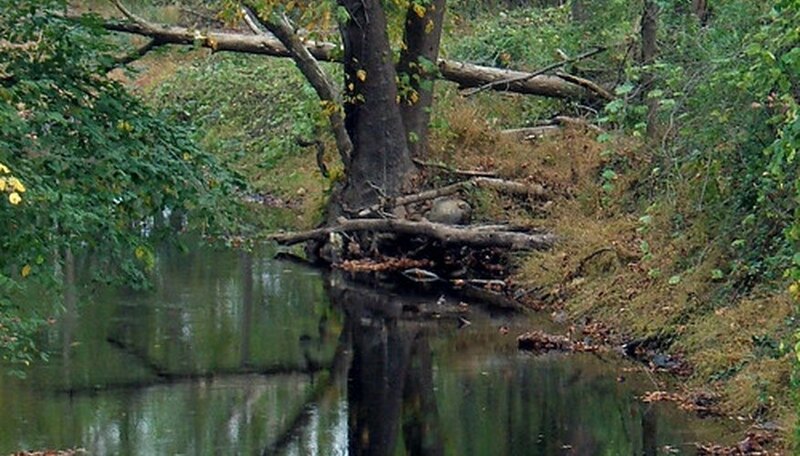 Many freshwater plants provide food for aquatic life by dropping fruit and seeds into the water. Herbivorous fish like to dine on tender underwater shoots that are usually highly nutritious. Plants add a natural aspect to a garden pond and help blend it into the surrounding landscape. 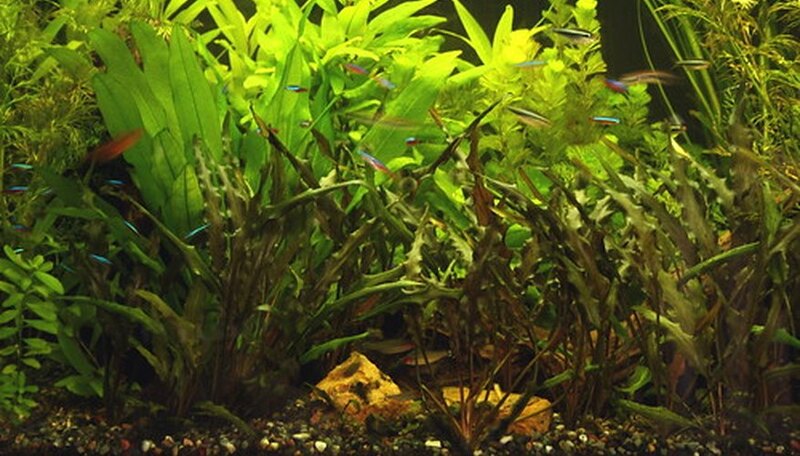 The addition of a few aquatic plants to an aquarium can transform a plain fish tank into an aquatic jungle. Chop the fish guts into small pieces. As with any material you are composting, the smaller the mass, the faster it will compost. Dig an area in your garden or yard where you plan to plant. Dig 2 feet down, spread the fish guts and bury them well. Do this at least six weeks before you plant. After six weeks, till the soil or work it with a pitchfork where you planted the fish guts. Fill the 5-gallon bucket halfway full with brown material, such as sawdust, leaves or straw as a base for your organic material. Pour molasses over your fish scraps until they are thinly covered. Molasses builds up microbes that break down the fish. Molasses also helps remove the odor of the decaying fish. Add several tablespoons of Epsom salts to the mixture. This adds sulfur and magnesium to your fertilizer, which plants require to grow. Put the fish scraps into the bucket and bury slightly under the brown material. Stir the mixture on a daily basis to add air to the mixture, aiding in the decomposition. Allow the mixture to rot for one to two weeks, then add the mixture to some fresh compost and apply to the garden. Water the potted plant or gardening bed before fertilizing. Soak it until the water runs out of the bottom of the pot or let the water puddle if it is in-ground. Allow the soil to drain completely. Mix 1 tbsp. fish fertilizer with 1 gallon of water. Add the solution to your choice of watering equipment. To apply the fish fertilizer to a large area use a hose-end sprayer; for potted plants a misting bottle is a good choice. Spray the plants with the fish fertilizer. Saturate the soil beneath the plants as well. Water again after applying fish fertilizer. Mix 6 tablespoons of a liquid fish emulsion product for every gallon of irrigation water, multiplying the recipe as needed to adequately water your vegetable patch. Mix large batches in a bucket or watering can just as you need it. Pour the treated water around the base of the plants and over the foliage if desired to water and feed the plants. Wet the soil to the degree of moisture that particular vegetable plant prefers. Repeat applications of fish emulsion with irrigation every one to four months in keeping with the dosing and frequency recommendations on the product label. Mix one tablespoon of fish emulsion to a gallon of water. Some concentrates may require more or less emulsion; always check the application rate on the container. Too high a concentration can burn roots or damage plants, according to the University of Arizona Extension. Pour or sprinkle the solution over foliage or on the soil at the base of plants in early spring to give them a boost. Apply in early morning or late afternoon. Avoid application during the heat of the day. Repeat once or twice a month, or when plants show delayed or halted growth. For blooming or fruiting plants, apply a week or two before blooming or fruit set to encourage healthy blooms and abundant fruit.